Website maintenance and keeping current is crucial to any online strategy and will help keep the site current and indexed by Google. An up to date website will help draw interest from potential customers. Website maintenance is key to this. A website, unlike a brochure, is never really finished; it is a work in progress. Many clients fail to appreciate this. The site goes live and then is forgotten about. A site that lies dormant with old information and receives no visitors is a waste of time. Always look at your site and see what could be improved. I would divide website maintenance into three sections - Visual Appeal, Content and Security. Keeping a website visually current has never been more important than from a technological point of view. As of writing, within months, Google is getting set to divide its index, giving mobile users better and fresher content. As a web developer this means a mobile first approach. In other words a website that is not mobile resonsive will receive far less visitors. So gone are the days of a website purely designed and built for desktop. More people are viewing your website on their mobile. It needs to not only look good but function well on a typical mobile device whether it be a mobile phone or tablet. Being a graphic designer I have always placed a great emphasis on how a website looks. With so many websites and competition out there it is important your site visuall stands out. Always think about freshening up a site with new imagery, graphics and photography. New photography can go a long way to re-engaging with the viewer and showcasing what a company has to offer whether it be products and/or services. I read a lot at the moment on other ddesign blogs about taking images out, deleting the slideshows and taking websites back to 'bare bones'. This is primarily to lower load times which Google views as a big ranking factor. A website with fewer images will load quickly so will be viewed favourably. Like anything it's about striking a balance. A quick loading site is ideal however there's no mistaking viewers warm to images. Especially on ecommerce websites. We are conditioned now to scan a web page very quickly and focus on the information that we are looking for. When used in the correct context images will help draw the eye in, particularily to key information or messages. Meanwhile up to date up to date graphics and imagery in a short slideshow can highlight new information or highlight offers in a very visual manner. On the other hand any redundant imagery whether photography or graphics needs to be deleted immediately. Most people want the information they are after instantly. If they don't see it they move on. This is why it's so important to make sure the information you offer is not only up to date and relevant but is organised in a way that it can be viewed as quickly as possible. Up to date and relevant content is key to website maintenance and is vital to winning new customers and keeping old ones coming back. Analyse your website and make sure all relevant information is up there. Ideally you want your website to grow and become a wealth of information. A go-to site where people can learn about what you do and provide a wealth of solutions to their questions. The by product of this being your following will also grow. An updated site results in more interest and more customers. Is the content on your website as well organised as it could be? Should certain sections be more prominent? Are the contact details up to date and prominent? Has the blog been updated or has the last article got 2012 stamped on it? What about a Questions and Answers section? How does your website look when viewed on a mobile phone or tablet? Has your company, services or products changed in any way that is not reflected in your website? Could you add testimonials or case studies to the site? Could you add further articles to the blog? Forgetting about a website once it is live is arguably the number one online mistake a client will make. It pays to keep a website up to date in order to retain customers attention and is looked upon favourably by Google. You can pretty much guarantee a person that updates her website on a continual basis is the person who will rise through the ranking system in Google winning new customers and work and be richer for it. One aspect of website maintenance that should never be forgotten is that of security. It is vitally important to keep a site secure from hackers. This is especially true for Content Managed System (CMS) websites which are database driven. In particular WordPress. Ninety percent of sites I now now build are WordPress sites. The WordPress system is incredibly popular and as of writing around 74,652,825 sites out there are WordPress sites. It is a great system and allows easy updates to content. With it being so popular hackers seek to exploit any WordPress vulnerabilities and gain access to the site. If you think a password has been compromised change it. Use strong passwords (not 'admin' or 'password123'). 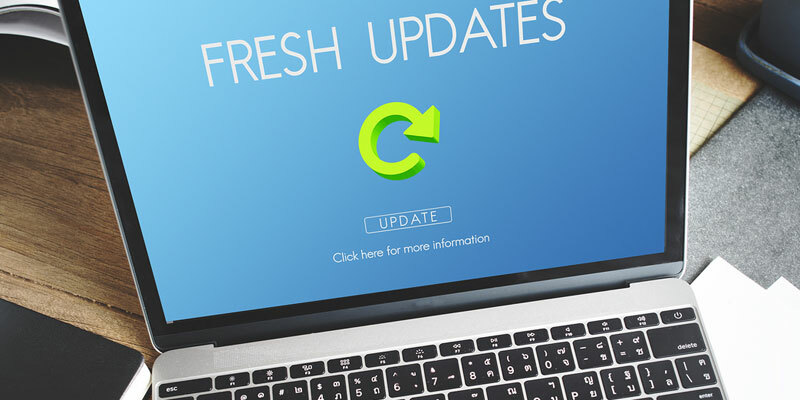 CMS providers like WordPress release updates and patches. Make sure your site is running the latest. Add any security plugins that maybe of use. WordPress has multiple plugins for this. One of the better ones is Securi Security. Make sure there are backups made to the site. Another aspect to take on board is actually securing a site with an 'SSL cert'. It is the standard security technology for establishing an encrypted link between a web server and a browser. This is a must for ecommerce sites that take credit card payments. However recently Google has indicated this is a positive ranking factor so many sites have now adopted the SSL cert to not only tighten security but also help gain a better Google ranking.